It's often said that, elegant though the Tube map is, it's getting increasingly cluttered as more lines and stations are added. Crossrail, the extension of the Northern Line, and the reintroduction of Thameslink will one day make matters even worse. So various attempts have been made to redesign the geometry (not least, our own stab at a 3-D version). This reworked map from Jonathan Fisher is the latest example. Like earlier efforts by Francisco Dans and Maxwell Roberts, Jonathan has dispensed with Harry Beck's original angles, introducing curves and circles into the diagram. The idea was to create a map that made clear the new orbital route created by the Overground connection from Surrey Quays to Clapham Junction — to make these stations and the line itself feel simple and like a part of central London rather than a tangled complicated suburban line. I liked the very simple idea of an inner circle line and an outer circle oribital line, and making these two circles have a simple relationship to one another, and I also liked the idea of making the centre of the circles the centre of London. 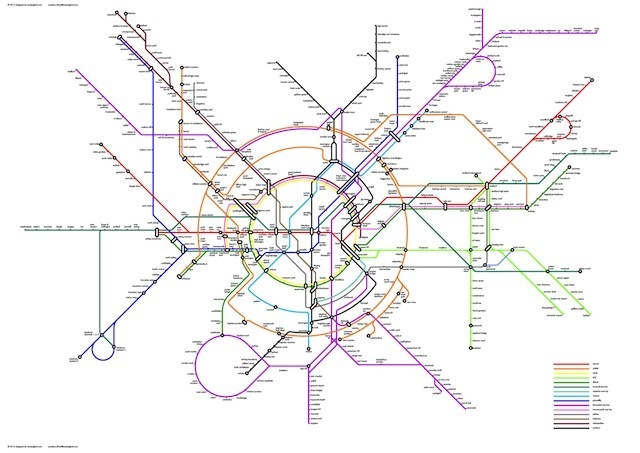 The Moscow subway map starts from a similar principle and I like that level of clarity. I started with this simple diagram of a small circle inside a large circle with the centre of London in the centre and then tried to make the rest of the map work around this. It admittedly creates some geographic peculiarities but I don’t mind this, its only a diagram, and primarily I was trying to create a beautiful clear diagram, not a geographically true one. What I always find strange about the current tube map is that it makes a half hearted effort at geographical accuracy but it actually isn’t true at all, its very misleading. Visitors to London believe that it's nearly true, but its not. I like the way this map doesn’t pretend it has any geographical honesty, it is purely diagrammatic. Also, I liked the way that by removing the Thames, and making London feel contained by a clear circle (the Overground), there is no distinction between north of the river and south of the river. London feels whole. Ultimately, it would be nice to see more concentric circles in the diagram (i.e. more around London routes). These would make travelling to the centre of London less important and (hopefully) strengthen suburban identities. The map certainly looks impressive and attractive, and includes the Thameslink route currently absent from the standard Tube map. Like all similar efforts, though, it does have its downsides. Chief among them is the dense central section, which would be difficult to read on a pocket-sized Tube leaflet. The elongated line interchanges — most notably at Bank and King's Cross — might also jar with some people. See other alternative Tube maps in our comprehensive guide.